(Newser) – Police in Queensland, Australia, are investigating a horrific accident that left four people dead on a ride at a popular Gold Coast theme park. 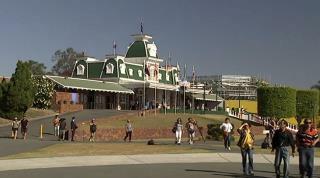 Two men and two women in their 30s and 40s died on the Thunder River Rapids ride at the Dreamworld park on Tuesday, with two people thrown from the ride and two others trapped in a conveyor belt underneath after what police describe as a "malfunction," the Sydney Morning Herald reports. The ride—described by visitors as one of the tamest of the park's 50 or so attractions—features six-person circular rafts moving along an artificial river, the BBC reports. The water was drained during a desperate attempt to rescue the two trapped people, reports the Guardian. https://www.youtube.com/watch?v=p7zTAWrK3a4 Looks like any other one i have been on. Australia, where everything tries to kill you anyway. The theme of this park is death.